When we think of Renaissance scholars, we tend to think of dusty, pasty-faced scholars locked in darkened rooms, poring over ancient tomes and tinkering with alchemy equipment. This stereotype, in some cases, may have an element of truth, but it does many of the great Renaissance men a great disservice. Michelangelo was a rugged man, given to dressing in rags and he was renowned for his hot temper, once suffering a broken nose in a fight with a rival sculptor. Another man who breaks the stereotype was Tycho Brahe, surely one of the most fascinating scholars of the Renaissance, renowned for his hard drinking, 'bad boy' image. He allegedly lost his nose in a drunken rapier duel, so he had to wear a silver and gold prosthesis. However, despite this questionable lifestyle, he was one of the most brilliant astronomers of all time, marrying natural intelligence with intuition and dedication. Tycho Brahe, in 1572, was the first astronomer to describe a supernova, using its appearance to challenge the Ptolemaic, geocentric model of the universe. In an era before the invention of the telescope, his accurate measurements of celestial bodies, using instruments he designed himself, laid the groundwork for the development of astronomy through the Renaissance and the Enlightenment. However, controversy surrounds the death of Tycho Brahe, and modern research has shown that the official cause of death, a twisted bladder, may be open to question. A research team from Aarhus, Denmark, has been given permission to exhume the body and is looking at a new angle: Was Tycho Brahe murdered? Tycho Brahe (1546 – 1601) was born in Scania, a region of Denmark that is now part of Sweden. His father, Otto Brahe, was a member of the Danish nobility, and he was taken in by his uncle, Jurgen Brahe, at the age of two. In 1559, at the age of 13, Tycho entered the University of Copenhagen, initially to study law, but he soon developed an interest in astronomy. The catalyst for this interest was the eclipse of August 21st, 1560, a phenomenon that had been predicted by astronomers, the accuracy of the eclipse forecasts impressing the young scholar deeply and determining his life course. He purchased an astronomical book, known as an ephemeris, which gave the location of celestial bodies at different times. After studying this and many of the other available texts, he came to realize the weakness of astronomy; very few texts and astronomers agreed about certain phenomena, making it difficult to make observations. In 1563, he wrote that this piecemeal gathering of information held back progress and that a concerted, long-term to chart the heavens was essential. 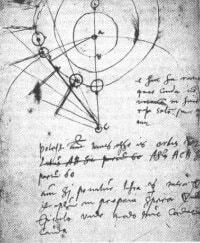 With the aid of his sister, Sophia, he began to take detailed measurements of the heavens, meticulously recording positions of celestial bodies, although this was before the discovery of the telescope, restricting the accuracy. The young astronomer also made many improvements to the available astronomical instruments in his quest for accuracy and perfection. In 1572, Brahe, on a journey home from a dinner in Copenhagen, noticed people staring at the sky in amazement. Following their lead, he looked up and saw that a new star had appeared in the constellation of Cassiopeia. Tycho immediately realized the importance of this discovery – the model of the universe proposed by Ptolemy must be wrong, because this new object proved that the heavens were not unchanging or fixed in a firmament and there was a much more dynamic process in action. Intrigued by the possibilities opened by this discovery, Brahe set out to make measurements of the new object, using surveying techniques to measure the position of the star at 6am and 6pm, every day. This twice-daily measurement, looking at the star at every half of a rotation of the earth, allowed him to use a method called the diurnal parallax to establish if the star was moving when compared to the background stars. After establishing that the parallax of the star was zero, this allowed him to state that the object was much further away than the moon or planets. In his book, De Stella Nova, Brahe published his belief that the star was a new celestial object and proposed that the heavens could not be regarded as unchanging. We now know that the object was a supernova, a dying star in one last great explosion. The subtle findings contained in the book contributed to an upswing in Brahe’s fortunes, as the king of Denmark and Norway, Frederick II, financed Brahe’s astronomy in Uraniborg, an observatory that incorporated underground rooms packed with astronomical equipment. At one point, Brahe’s research consumed 5% of the yearly economic output of Denmark; such was the King’s devotion to his astronomer. Brahe used the wealth to build huge astronomical instruments in an underground station, complete with a roof that could be pulled aside with pulleys. Brahe remained here for 20 years, making observations that would eventually fall into the hands of Johannes Kepler, allowing him to formulate his theories about the universe, including his Laws of Planetary Motion. These good times had to end and, in 1596, when Frederick II died and was succeeded by his son, Christian IV, Brahe found that the royal goodwill ended, and he had to flee the country. In 1597, he settled in Prague where he became the court astrologer of Emperor Rudolph II, of the Hapsburg dynasty. The Death of the Astronomer – Was Tycho Brahe Murdered? 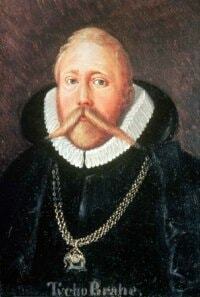 As the story goes, Brahe, a vivant with a taste for copious amounts of rich food and good wine, died at a banquet. He was too polite to excuse himself from the table to go to the bathroom and this caused his bladder to twist under the pressure of the accumulated urine, ultimately killing him. Kepler related that the astronomer took 11 days to die, unable to urinate and in a great deal of pain. On November 4th, 1601, the astronomer was given a full state burial in Prague, his body kitted out in full armor and his coffin escorted by 12 imperial guards. Rumors of murder resounded around Europe, with wild speculation and conspiracies dominating conversation in aristocratic circles, although there was little evidence to support these theories. That is, until 1991, when the Prague National Museum, with Brahe’s mustache in its collection, sent a few hair samples to Denmark for analysis, in an attempt to establish the cause of death once and for all. The lab tests found that the hairs contained a huge amount of mercury, more than 100 times larger than the normal level expected in a body of that period. This cause of death was believable, considering the lifestyle of Brahe, but modern researchers made interesting discoveries that cast some doubt upon this official story, creating a whodunit worthy of a Shakespearean play, with some literary historians speculating that the death of Tycho Brahe gave the Bard the idea for the play, Hamlet.